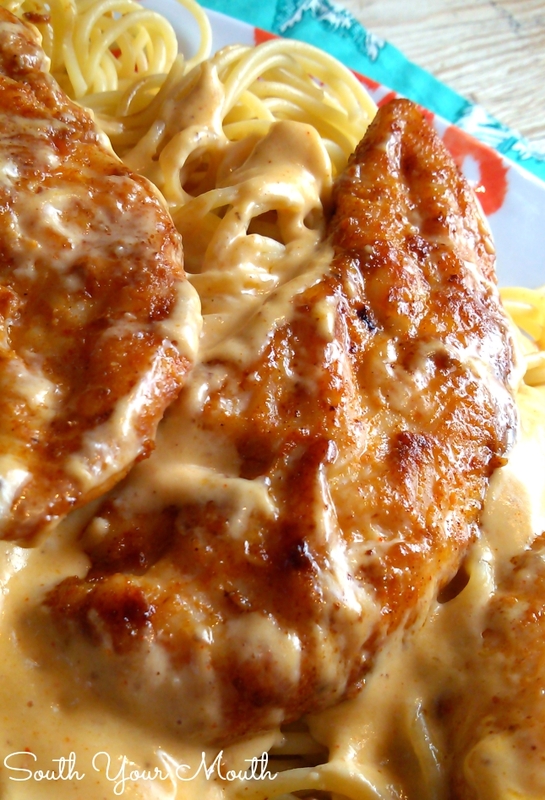 Seasoned chicken pan-fried in butter with a super easy cream sauce served over pasta. Before I became friends with Steph over at Plain Chicken, I was certain she would think I was a stalker if we ever met. She and I have sooo many of the same or similar recipes! Because she has amazing taste. Obviously. Then I was like I want to know her. So I drove to Alabama and hid in her neighbor’s hedgerow and watched her for three days before I made up some story about a flat tire and Can I use your phone and now we’re best friends! Sometimes I really just want to see if you’re paying attention. But seriously, sometimes I’d see something on Pinterest and be like Hey, I make that too! Then click over to the recipe and discover it lead me to Plain Chicken. There’s one recipe Steph has that I’d never heard of before and knew I wanted to try it because, I mean, LOOK at it! This recipe couldn’t be any easier and the leftovers heat up like a dream! You just season up some chicken, pan fry it in a little butter, dump in some cream and voila! Combine garlic, salt, onion powder, chili powder, paprika and white pepper in a separate bowl then mix well. Reserve 2 teaspoons of spice mixture and set aside. Season chicken with remaining spice mixture. Heat 3 tablespoons butter in a large skillet over medium heat until sizzling. You can’t get the butter too hot or it will burn so keep your heat set at medium. Add half of the chicken pieces and cook until nicely browned. Add 1 more tablespoon butter then flip the chicken and brown on the other side. Once chicken is nicely browned on both sides, remove from pan. Repeat this process with the remaining chicken and butter. Set chicken aside then cover with aluminum foil to keep warm. 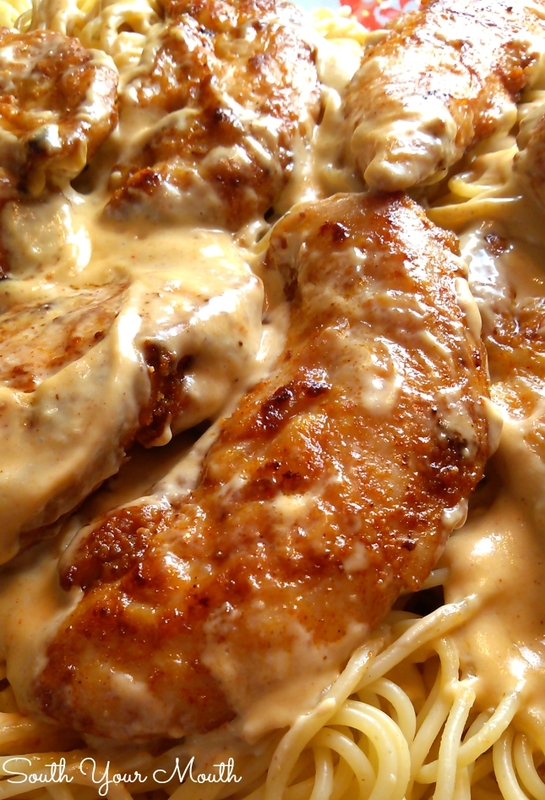 Serve chicken and sauce over cooked spaghetti. Sometimes I take my chicken for a swim through the sauce once it's ready to make sure the chicken is nice and hot. I used 3 cups of cream (vs. the 2 in the original recipe) to ensure there was enough sauce for 6-8 servings. You can substitute black pepper for white pepper but I'm telling ya, white pepper takes this to a whole other level of awesomeness. Feel free to cut this recipe in half. I would suggest using 2 cups of cream, though, because wouldn't you rather have too much sauce than not enough?? Original recipe from Plain Chicken. UPDATE: There's been some discussion about the sauce not thickening and/or adding cornstarch and flour to the cream to make it thicken. If you use real, heavy cream (36% fat or higher) the sauce will thicken on its own beautifully. I have made this dozens of times and never ever never had any issues with the sauce thickening. Just simmer it (slow, small bubbles) until it's thick. You could *probably* substitute milk and flour instead of heavy cream. Use 1 T of flour for every cup of milk. Mix the flour with the butter/grease then add the milk. Stir until thickens. Well a natural food like cream beats a fake food or a flour thickened paste. Cream is real food. - why are people afraid of it:? Use FF evaporated milk. *I'm* not going to, but it's a good substitute if you're scared of the cream. Agreed, I have made this numerous times, delicious!! Agree....real cream please...just don't be a pig at the trough. Each mouthful should be savoured. I've never heard of Chicken Lazone but I am loving it!! Looks simple and fast to make, perfect for a weeknight meal! Bring on the cream!! Pinned! looks great! I will try this soon! You are so funny! We are definitely destined to be besties! So glad you loved the Chicken Lazone as much as we did! That's right. I have used that product and it is surprisingly good. So, if someone absolutely MUST avoid calories - and for this recipee, I am NOT one of those people, despite the endorsement - it's a reasonable substitute. Just sayin'. I trust cows much more than a chemical made by people in hair-nets. Just eat the cream. The thing that will make you fat in this recipe isnt the butter/cream...its the pasta. second ingredient in LoL FF 1/2&1/2 is corn syrup . . . ends with added color. This is a once a quarter meal, not a suggestion to add to the weekly rotation. LOL forget the stalker comment,I would just like to be there when Steph does her recipes!! (yep I subscribe to her blog). Thanks to the both of you ladies for putting it out there in cyberland for us to gleam recipes from instead of pizza every night lol !!!! This looks amazing and I will be making it soon. This recipe (minus the spaghetti) is completely low carb and will be legal on my low carb diet. I will substitute the pasta with spaghetti squash or zucchini noodles. I've lost over 50 pounds in 7 months eating food like this, so I'm not afraid of the butter or the cream...both of which are very low in carbs! Thanks for sharing!! I was thinking the same thing! I'll use either spaghetti squash or zoodles, too! Cindi, CONGRATS!!! Do YOU have a website or blog I could check out for your eating plan? Your numbers are off the chart, I would love to see just what you eat. THANK YOU!! Love the ice-cream comment! I'm making this tomorrow for my office (25 people) so I'm assuming it translates pretty easily if I quadruple it! I'm not afraid of cream either ... sounds so yummy can't wait!! Made it for the office and they LOVED it! Even finished leftovers the next day ... will definitely add it to meal rotation from now on thanks!! This recipe is right up my alley! Cream and all. We subscribe to a low carb diet so I'll be using zucchini noodles (Which my kids are loving...as if they have a choice:) BTW...your "Notes?" They tickle the crap out of me!!! This looks delish. Will be cooking up soon. What????? This looks incredible. I need this for lunch. I can't wait to try this! It looks wonderful! About to make this for a second time; absolutely wonderful. Love your site, and having a great time with your recipes. Keep it coming!! just made this-- it was really great!! didn't have the white pepper, but still awesome! Hahahaha, I LOVE your notes! Can't wait to try this! I've been making this for a couple of years. Got the recipe from Plain Chicken. I've also used shrimp instead of chicken. That's good too! So going to try this sometime this week, constantly on the look out for new recipes to broaden my recipe book!! looks sooo yummy!! I love this recipe and shared on FB. Although I'm retired, my still-working teacher friends will enjoy how quickly this comes together! I made this last weekend. It was so easy and so delicious. At the end of cooking I did add some tiny frozen peas just for some added color. This stuff is delicious! Delish. Made this tonight and it's worth every bit of the cream! :-) Would make again since my whole family loved it. I served with steamed broccoli and parmesan so we had something healthy (ha, ha!). I only had 2 c. of whipping cream so my third cup was half 'n half. Thanks for a great, simple recipe on a busy school / work day! Omg! Love recipes like this that taste like I spent hours cooking but done in no time. I love serving my family delicious meals and because of health issues I can no longer stand at the stove for long. This recipe is perfect. Love that you increased the cream for more sauce. I always debate whether I can get away with doing that without changing the end results to much. And I for one am not worried about the cream, butter or pasta its not like we are eating like this every day of the month, I highly doubt that when I die the doctor says "that woman should not have eaten chicken lazone once every month or so". I'm on a Keto diet ( no pasta) so I can have all the cream I want. This is perfect served over spaghetti squash ! Yummy ! This looks delicious! I think I'll make it & serve it w/ the corn casserole that I just found on this site, along w/ asparagus or brussels sprouts! My question, how do you think this would work w/ rice rather than the pasta? Im just a bit confused as to why it looks like there is Sauce in the Recipe...I am assuming chili powder or is the Recipe missing something or am I???? Most delicious ever! Bring on the cream because that sauce is AMAZING. I am trying this for sure, it looks delicious. 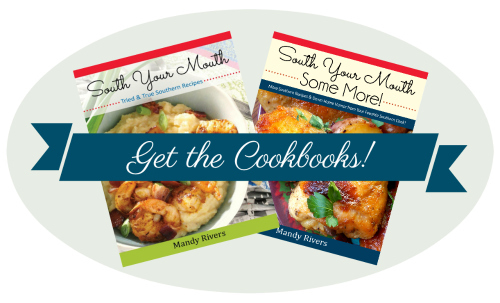 I simply love your recipes and have made several that my sweet southern family has devoured. I like to try new things so on this one I changed it up a little by adding about a cup and 1/2 of sweet peas and sauteed them in the chicken drippings for about 20 min with fresh garlic and some finely diced onion. Then I added the cream and some fresh parsley. Delicious! I also love many of the recipes, but I do sometimes make a lighter version . The spaghetti squash will work great! I can hardly wait to try this recipe. My first reaction to the ingredients was, "Oh my poor arteries" and then like those of you who worry about the fattening part.............I said to myself, "I'm not eating this every day, so go for the gusto". Life's too short to deny yourself. Happy eating! Please note: I have never had this before. I can't tell you why heavy cream wouldn't have thickened after simmering for 20 minutes (that blows my mind??) unless it was low or no fat. The 1 teaspoon of seasoning mixture plus additional salt and/or garlic powder to taste should have seasoned the sauce nicely. I'm sorry to hear you didn't have a good experience. My crew asks for this once a week! And more chemicals, more processing and more, more and even more of stuff you don't want. I've heard it said that if they take out something, they have to put something back and that something is rarely good for you! It's ALL about moderation and eating a variety of foods. Mandy--this is DELICIOUS. I made it tonight and used boneless skinless thighs. Used the 2 cups of cream since I don't have as many to feed as you. I left out the pasta and ate it plain, mainly cuz I was too lazy to cook the pasta. Happy New Year (long time no hear from ;) hope all is good with you. Wow, this was absolutely awesome. After reading others' comments about the sauce not thickening up, I made one tweak. After cooking all of the chicken, I added flour to the remaining butter in the skillet 1 teaspoon at a time until I felt it would thicken the cream, I ended up adding 3 teaspoons. I then added the cream and cooked over medium-high heat for about 10 minutes, whisking continuously. I then returned the chicken to the skillet and let it warm on low. It came out perfect! I am eating the leftovers for lunch right now and they are as nummy as ever! Great recipe! Can I ask what people consider heavy cream? I am a bit confused by this, cause I take that as being whipping cream, but so unsure.... And just a little tidbit of info, if you don't want the clumps and the flour tasting, use cornstarch. So much better!!! I'm going to make this for Sunday dinner this week with all the fat and everything else that goes with it. People the website says South Your Mouth, good southern food is suppose to be fattening. If you don't like it Weight Watchers has a lovely website with healthy fat free dishes for your heart's desire. Mandy I started following your site the summer of 2015 and I've been addicted ever since. I even have a coworker using your site for recipe ideas. Hopefully the hubby will enjoy this recipe like the others I've made. This is a new recipe for me, but form your photos, I want it now. I have now made this dish several times. My Husband and family ABSOLUTELY LOVE THIS. We even made it for a dear friend just returning from the hospital. It is amazing. Made this for dinner tonight, was REALLY GOOD!!! Nice combination of flavors. my sauce was not thickening up, so I added a package of Knorr Alfredo mix... Was hoping I did not ruin the recipe, but still came out AWESOME!! Thank you.. I made this for my family and we all loved it!! Delicious! Thanks for sharing! Hi iam from Down Under in Aus and have made this receipe as is several times now and trust me its beautiful!!! I made this last night and it was DELICIOUS !! My only change was that I did not have 3 cups of heavy cream, I only had 1 cup. So I used 1 cup of 2%milk and 1 cup of sour cream and it turned out great. But, I did use 1 tablespoon cornstarch in about 1 cup cold water to thicken the sauce. This is definitely a keeper !!! My 2 and 5 year old both ate this, without any complaints for any spitting food back out. I can't believe how flavorful this dish is. It is SO GOOD!!! I made it exactly as the recipe states and my whole family enjoyed it. Yay for quick, great tasting dinners!! First time I've replied to something like this, but I've made this several times and EVERYONE loves it. I make it with rice. I was thinking about trying it with rice too. OMG This was FANTASTIC! Yes fattening but ohhhh soooooo good! We had no leftovers. I'm a little sad over the no leftovers but it was a huge hit. Will definitely make it again. I made it exactly as recipe states. Perfect! One of our new favorites! Thank you! Quick question...Do you boil down your cream with the cooked chicken in the pan or boil down the cream THEN add the cooked chicken back in? This was a huge hit at our table! We will definitely be making this again. I served it with angel hair but I think it would be good with mashed potatoes too. I didn't have heavy cream so substituted half and half and it came out great. I saw another reviewer mentioned adding sundried tomatoes...I agree that would be excellent! Delicious and very easy recipe. This was delicious. My husband inhaled his dinner and then sharked my plate. I'll be making this again. Just happened upon this recipe and had cream in the fridge. This is AMAZING and so easy. My husband said, this is a restaurant quality meal! I will make this for company for sure, we served it with caesar salad (my husband's home made dressing) YUMMY!! Thanks so much! LOL, please share your husbands recipe for Caesar salad dressing, I love salads too! Oh my! This was heavenly! this looks amazing! I can't wait to try it! Keep up the great cooking. My family and I are enjoying it! Cooked this dish this past weekend...AMAZING!! Followed the directions and it turned out perfect! This will be a 'go to' in our house from now on! Gonna put that Low Country Chicken Bog on the table this weekend! Love all of Mandy's recipes and the fact that she is a local Lexington County girl makes it all the better! So... I know you can't make it in a crockpot (I love your note on this) but... can you make it in a pressure cooker?!? I don't think it will be spicy! It just added a good flavor! I would leave out the spaghetti and serve it with mashed potatoes and a veggie. We made this and loved it!! My hubby added a little ghost pepper salt to his for an extra kick. SO good!! Definitely small portions though! It is rich, but YUM! This looks SOO good. 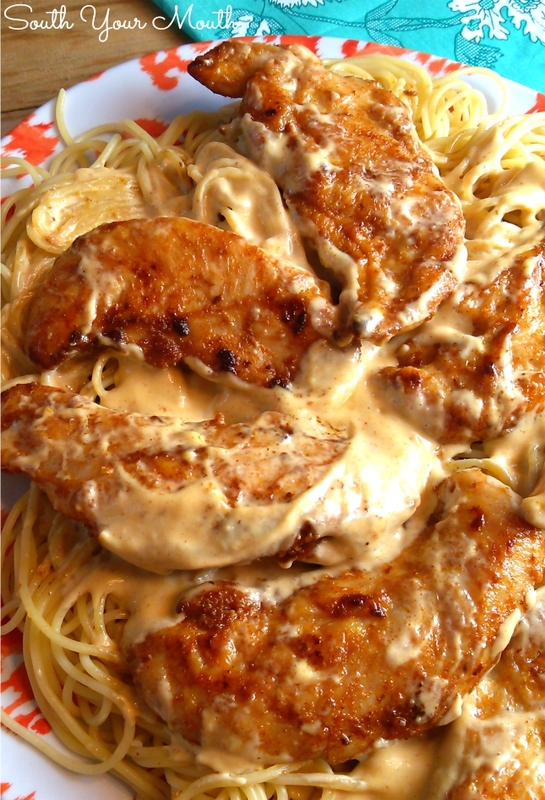 I am making this for dinner tonight, question though, when you cook the chicken and do you take the chicken out and then add the cream or do you add the cream with the chicken in the pan still? Seriously??!! What is the matter with people? If you don't want to cook with cream, then don't. When you see the cream (or butter or whatever your complaint is), think "Oops - this one's not for me" and move on to another recipe. If you're looking for low fat recipes, do a google search for those. Honestly, I despise salmon but I have NEVER posted a comment to a recipe with salmon to complain about its presence. This sounds wonderful. Trying it tonight. I will be serving it with steamed broccoli and a salad. This looks fabulous. Thank you for posting this. I will so be trying this soon. I AM NOT AFRAID OF CREAM. There is nothing wrong with cream in a healthy diet as long as you are not eating it everyday. Come on people isn't there enough bitching in the world. Just be thankful that we have so many people taking the time out of their lives to post these. I for one am grateful. If you don't like it, don't comment! OM Gosh, THIS IS AWESOME!! I made this last night and it was sooo good! I followed the recipe as written but added an extra cup of cream since I like more sauce. To warm the chicken, I added the chicken when the sauce was thickened and let it simmer for a few minutes longer. This is a keeper. I am also going to try this with steak. I made this tonight and it was scrumptious! Really, really good! I did need to add some more garlic powder and salt to the sauce after it had thickened (and yes, I used the cream!) and we all loved it! Also, it was pretty easy and quick. Will definitely be making this one again! Excellent!! I served it with farfalle (bowtie) pasta. Delicious! I will definitely make this again! Wow!!! We just had this for dinner and I got the highest praise from my hubby. "let's have this again soon" That's when I know I have a hit. I didn't have the cream and wasn't about to drive for an hour to the grocery, so I used half & half with a little instant flour for the sauce. I had some mushrooms that were looking for a purpose in life so I added those to the browning chicken. It was a spectacular dinner that didn't take a lot of time to make. Love, love, love! Thank you! I make this fairly often and it is delish! I always add extra spices because I like it spicy. So, so so good! My 13 year old didn't care for the sauce, but she loved the chicken... and she hates everything! This was definitely a hit! I'll be making this again. Thank you for a terrific new recipe. Could you also add a little bit of white wine to "spike" it up a bit?? I just made this dish it's awesome !! I have made this a couple of times before based on the Plain Chicken recipe and it was really good. I'm going to try it with your suggestions and see how that goes; your pictures look awesome! I can tell your tweaks will make it even more flavorful! Can't wait to try this again! Love your site! It was amazing!!! The whole meal was delicious, and the sauce was perfection! Thank you! Made this for dinner tonight. Family loved it!!! Flavors on point, nothing more to add. Perfect! Made this fun or dinner tonight. So so good! Super easy too. I halved the recipe and ended up with too many noodles, but I can always use those for something else later. I also might add a little less salt next time. Other than that: yum! Definitely making this again. Becky, I agree. Processed white sugar is the real killer. I've made this receipt many times. Now that hubby is on keto, I use low carb pasta. This recipe is literally one of the best things I've ever eaten. I can't find heavy cream at my grocery store. The only thing I was able to find was heavy whipping cream. Is this the same thing? Mandy you crack me up! I found your blog when I was looming up a recipe for something and I found you on Facebook and followed you because you are hilarious and your recipes are delicious. Followed recipe just as instructed with one addition... I added 1/2 cup of grated parm cheese to sauce. Love this recipe...3 cups of crea and all. Stop being afraid of cream! Its a natural ingredient the body can process. Just use portion control.